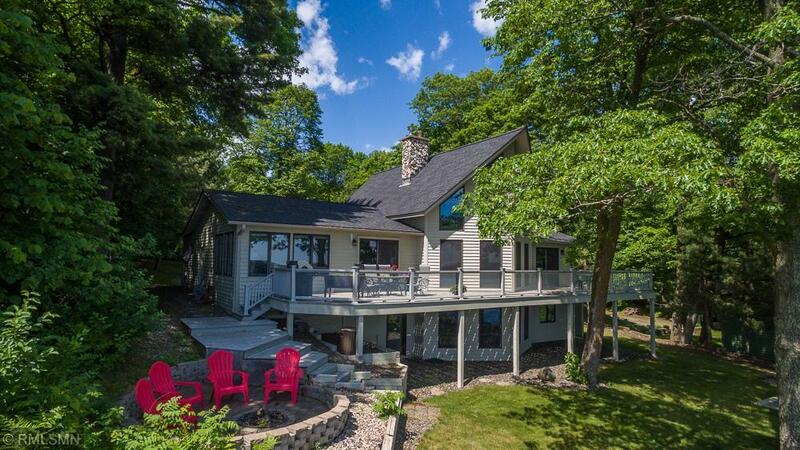 Enjoy big lake panoramic views from this immaculate 3+ BR, 3 BA home, features include a 2-story great room w/floor to ceiling real split stone, wood burning FP, a wall of lakeside glass opens to a huge 14â x 56â lakeside deck, vaulted ceilings & loft. Bright airy kitchen w/ custom cabinets & Corian tops, 2019 Remodeled the Liv/Din/Kit/Sunroom areas to open the living area floor plan, installed and refinished matching maple floors through-out (see pictures), full walkout lower level includes an ensuite, fam rm & hm office. Prof landscaped grnds, privacy, tram to lake, hard sand beach, attached insulated and finished single garage & detached 4 car garage. New furnace and water heater 2016, new roof 2015. Some furnishings are negotiable.